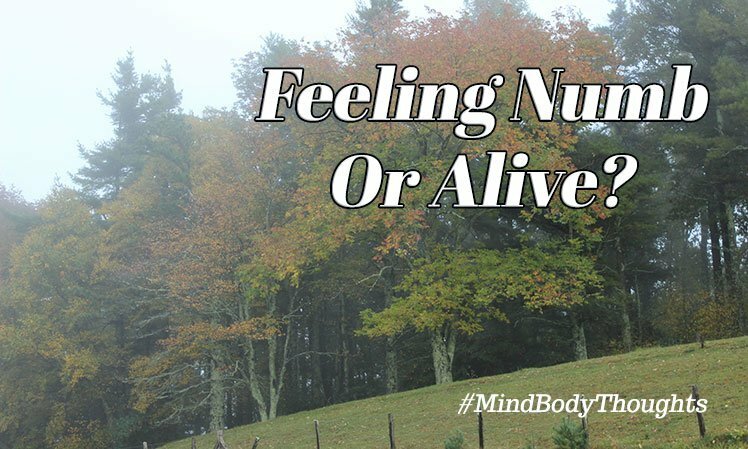 We all feel alive or numb at some point in life. We all know about it. Unfortunately, we live in a world where we don’t always realize it. Numbing is our “go to” device when things get tough. However, if we continue to numb, it will play havoc with our mind, body, and emotions. While numbing can be a detriment to our lives, it can also be helpful. Consider the following examples and see how they fit in your life. Take the case of a person who has had an accident and cut themselves so severely that if they don’t get help quickly, they will not make it. If the individual feels everything that they are experiencing, the pain will overwhelm the mind. There would be a good chance the person would not be able to deal with the situation and pass out from the pain. By numbing, the individual would be able to do what they needed to seek help. In this case, numbing is critical for the person to stay alive. Another example would be where the person has been through tremendous trauma in their life, such as childhood sexual abuse. To cope with being raped and molested, the child could not feel everything that was going on while it was happening. Unfortunately, without proper resolution, the child grows up into an adult holding it all in. They numb themselves to the full essence of life. They may appear happy and positive to their friends and the world, but deep down inside they are so numb that the torment they live with is the only feeling they know. In this case, numbing is what is keeping them in the experience. What Causes Us To Numb? There are many times we find ourselves in situations and moments that are more than the mind can comprehend. Some moments are just too great for us to begin to make sense out of and piece together. There are times that horrible things have happened to those around us or in our world that are just too much. It’s then that the only thing we know to do is to numb our mind, our body, and our lives. When we experience these moments, the brain fires rapidly with hormones and substances that assist our bodies in dealing with the threat, sadness, or grief. It pushes us into strength beyond the moment so that we can find some sense of normalcy. It is our survival at that moment, and it is meant to help protect us and deal with that experience. Unfortunately, if we continue to numb and stay in this experience, it will eat at us from the inside out. It will rob our minds of the capacity to see life that is full of joy and love and fulfillment. It will keep us locked in the moment that has passed, just as if we are still living it at this current moment. While thinking positive thoughts and looking for the good in all things around us can be helpful most days, if we do this at the expense of feeling the numbness, we are only hurting ourselves. What happens in the body is in the body, not just the mind. If we focus solely on healing the mind or making the brain think that everything is okay, we negate the cellular memories stored in the body. To reconcile these things, we must connect the mind and body, or we are only working with half of the equation. The more we numb, the more we are still living in the past with no “get out of jail free” card. We have sentenced ourselves to a life of imprisonment, and at the same time, we hope that our days get better. To come out of numbing is more than attempting to stay present in the body. It is more than a meme or affirmation. It is more than becoming an actor in life, where we portray to the world that we have everything together. Fear often keeps us in numbing and fuels the horror we face. It is a strong force, and if we don’t stand up to it, it will take us down. Fear keeps the blinders on so that we don’t readily see just how much we are numbing. The ticket out of the torment is to become one with the mind and body. It is the moment where we feel everything, including pain, so that we can take back our power. It is the moment where we go inside, and we genuinely feel all those parts of our closets that we seldom ever see. It does take courage to walk through the fire to free yourself from the numbing in life you experience. Often, it takes someone holding your hand as you walk down that path and shining a light ahead so you can find your footing. It takes going into the body, past all the blocks we have built up, and allowing ourselves to connect with all that resides in us physically. When we connect physically with these moments that have pushed us into numbing, it is then we have the opportunity to heal our lives in ways we may not even imagine. It is that connection we make with the mind to what we feel that allows us our ticket out of the horror. The result is a world of peace, joy, and deep love for all humankind. It is the moment when we go into these places, which allows us to see life from a much higher viewpoint. I have suffered through a Conversion Disorder as a result of my own life’s experiences. Because of the terror and fear, I went through, I had to numb to survive. It almost cost me my life. It took me many years to start learning how to turn my life back on, not numb from it. No one needs to tell me just how horrible numbing can be because I lived it. As a result, I’ve healed some of those dark places of my life, and I continue the healing every day. It now has given me a real purpose and calling. It has helped me find joy, peace, and comfort through moments that exist today in our world. I am discovering that I have much more possibility in my life to heal, not just suffer silently in pain. Numbing is our go-to device. If we stay in numbing, we are sentencing our lives to a continuation of the torment we so want to escape. There is a way out, but we must be willing to take that step. Through courage facing our fears, we reclaim that which is rightfully ours. “When human beings are exposed to difficult experiences, in order to avoid the pain, we go numb to block the pain. Little do we realize, we are blocking the joy and deep inner workings of our body. When we stop numbing, we can stop illness and disease. The more we numb, the less human we become to one another in this world.” – Dr. Paul Canali, founder of Unified Therapy™ and Miami’s Evolutionary Healing Institute.